For an experience that will stay with you forever, our 1830's stone-built town house in the grandeur of cobbled Regent Terrace offers an exceptionally tranquil retreat on the verge of Edinburgh city centre. A range of spacious, self-catering suites offer high quality and breathtakingly spacious Festival accommodation with excellent natural lighting. 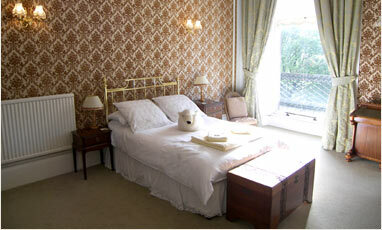 Our apartments sleep up to 5 people each, with 1 double bed, 2 singles and one fold-up bed. Please contact us for availability enquiries and booking. Our Regent apartment is extremely comfortable but affordable self catering accommodaton and a good base for exploring Edinburgh and Scotland. Unique views across to Queen's Park, Arthur's Seat, Holyrood Palace and the Scottish Parliament — You'll be eager to start exploring! 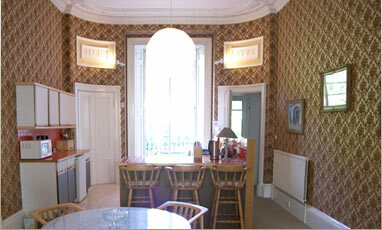 Less than 10 minutes walk to Princess Street, the famous Royal Mile and its many tourist attractions. All of our self-catering Edinburgh apartments are non-smoking and we regret that we cannot allow pets. We do not book hen nights or stag parties. If you require anything extra please get in touch as we try to cater for all needs. 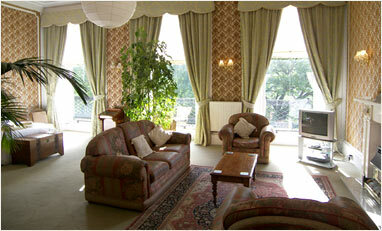 For larger parties, multiple apartments can be made available, or an extra bed can be arranged for parties of 6. Fully fitted kitchen, and all conveniences. We provide all linen and a grocery pack to get you started. Some apartments equipped with a power shower or Jacuzzi-bath. On street parking is available, though this area is metered. We can direct you to free parking 5 minutes walk away. Based in Edinburgh City Centre, this self catering accommodation is ideal for the Edinburgh Festival Fringe or for exploring Edinburgh and Scotland.